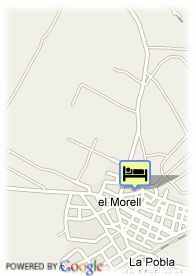 Pareteta 6, 43760 El Morell, Spanje. 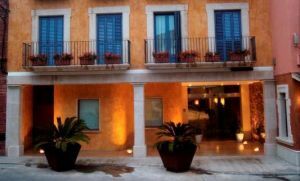 Gastronomic hotel with charm in Tarragona. La Grava is a small friendly hotel, with a family and professional staff, where the most select gastronomy joins together with a stay full of comfort. This establishment is located inside an ancient village house from El Morell that respects the buildings and the charm of its time adding them to the newest services and facilities. Its rooms are all outer, different, quiet and very light. They are exquisitely decorated, offering, among other high ranged equipments, hydro massage bath or pressure shower, mini bar, Internet connection and TV. But the real essence of the La Grava Hotel is its cuisine. It stands out there the excellent raw material, part of it being land products. Its restaurant is one of the most admired and wee-known from Tarragona. The modern facilities of the La Grava Hotel are completed with a magnificent outdoor swimming pool, terrace and free car park. A wonderful hotel which cares and fusses over each one of its guests' feelings.